I am so pleased to announce that a story about my young days as a punk rock zinester back in Portland, Oregon has been published in the wonderful journal Remedy Quarterly. Run by Kelly Carambula of the fantastic food (and lovely cocktail) blog Eat Make Read, the publication features “Stories of food, recipes for feeling good.” Each issue is put together around a theme and the newly released issue number six has “Stealing” as its binding idea. As with anything theme driven it’s really fun to see how each author interpreted that theme. My piece takes on the late 1990’s punk community’s views on stealing and how we used that to our advantage to help feed hungry zinesters at the first Portland Zine Symposium in 2001. It also features a recipe for my potluck standby, peanut tofu noodles. Not only is Remedy Quarterly a pleasure to read, but it is beautifully designed. It even features original fonts by Aaron Carambula, among others. In this digital age it’s nice to find a beautiful magazine you can hold in your hand, so the article is only available in the paper journal. Treat yourself! And why not subscribe and support independent publishing and cooking? And yes, I totally cross posted this to my food blog, 2 Cooks in the Kitchen. 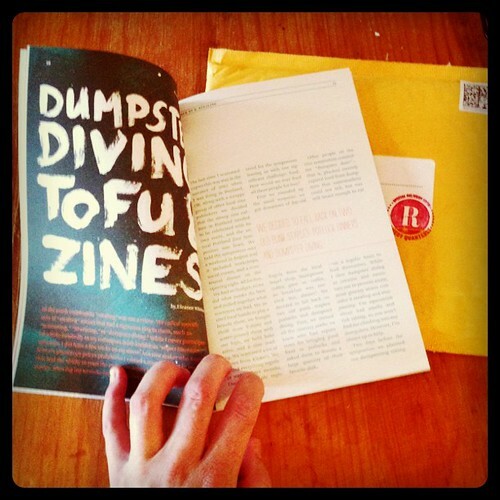 This entry was posted in Brooklyn, Food, Writing, Zines and tagged Eat Make Read, food, indepdendent, magazine, publishing, recipe, Remedy Quarterly, tofu, Writing, Zines. Bookmark the permalink.